Left to right: BPP tutor Charlie Radcliffe, Baker McKenzie partner Kirsty Wilson, Hogan Lovells partner Rebecca Wales, NOTICED co-chair Ramesh Pani and Mayer Brown associate Emma Sturt. 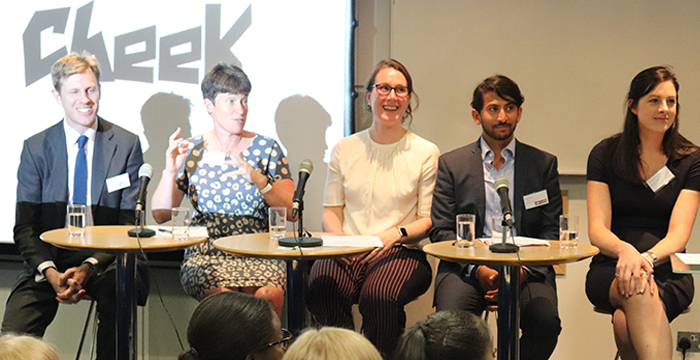 At Legal Cheek’s ‘How to make it as a City lawyer’ event earlier this month, a host of City lawyers delved beyond the glossy graduate recruitment brochures and provided wannabe solicitors with an unfiltered view of life in the capital. Gathering at BPP University Law School in Holborn were: Kirsty Wilson, a corporate partner at Baker McKenzie, Rebecca Wales, a commercial litigation partner at Hogan Lovells, Emma Sturt, an associate in banking and finance at Mayer Brown, Charlie Radcliffe, a tutor at BPP University Law School and Ramesh Pani, co-chair of diversity organisation NOTICED and associate at Ashurst. Many trainee hopefuls face the difficult question of whether they should start their careers in or outside of London. With the ever-increasing salaries of City lawyers, it is understandable that the money is a big factor. “That’s not something to sweep under the carpet”, says former Simmons & Simmons lawyer Radcliffe, “the rewards are very high when you’re working in the City”. Baker McKenzie’s Wilson thinks it’s imperative students know what they’re looking for in a legal career, “do your research, but then make it applicable to you”, she advises, “but remember: the choice you make doesn’t have to be forever”. Pani read law at the University of Manchester, but reveals to an audience of over 120 that it was the opportunities and exposure available that drew him from the North to the South. A number of City firms are expanding into regions through the launch of legal hubs and the panel were asked whether this trend poses a threat to the City. Hogan Lovells’ Wales doesn’t view this as a challenge. Her firm recently opened an office in the West Midlands which forms an “integrated part” of the firm’s London HQ. A large team of Birmingham-based paralegals, trainees and lawyers can now assist their London colleagues in areas such as litigation, real estate and corporate transactions. It’s the ability to work in teams across different departments and offices, bouncing ideas off others, to get something over the line that Pani enjoys most. “The sheer scale of work — that just isn’t available in the regions at the moment”, he says. Wales remembers when the BlackBerry became an essential workplace tool and feeling that you couldn’t put it down. “It’s important to impose self-discipline and know when you need to react”, she says. A difficult judgement for juniors, she notes, is when they’re copied into a relentless number of emails. It’s important to be able to differentiate between what is critical and what can wait until next week. “Just because you receive a letter from the other side at midnight does not necessarily mean it has to be read at midnight. It’s perfectly reasonable to wait until the next day”, she says. City law is a very personal lifestyle choice, says Pani, referencing the sleeping pods available at some City outfits. “There are long hours in many professions — you have to weigh up the pros and cons and see whether this is for you”, he says. Lawyers are taken care of, however. If Pani happens to work late one day, he’ll get his dinner paid for and a taxi home. Mother-of-two Sturt recently relocated to Buckinghamshire for a better work-life balance. It’s very commutable, she says, and flexible working allows her to work from home one day a week. With regard to working hours, Sturt has the added benefit of being in a previous career. The former civil engineer appreciates that although the hours are longer than her previous nine to five role, Sturt finds that she’s no longer “clockwatching” because she’s enjoying what she does.